Joe Graziano began his career over 20 years ago and became interested in financial services at an early age. Early in his career, Joe’s brother John invited him to join the firm. It was then that Joe became very interested in the concept of true, long-term financial planning. For the last 10 years he has been a partner with the firm which now has over 100 advisors and two billion in client assets under advisement. Today he looks forward to staying current in this ever-changing field and meeting with clients to help them achieve their long-term financial goals. Joe enjoys seeing financial plans evolve to help clients reach such goals as a comfortable retirement or being able to send their children to college. Joe has an accounting degree from St. Peter’s College and is a Certified Financial Planner (CFP®), each of which has helped him to fully understand clients’ financial pictures. Joe is also very passionate about the planning business and prides himself on keeping abreast of industry trends and the latest planning techniques. He typically reviews about 10 financial-planning periodicals monthly and personally attends several industry conferences a year. 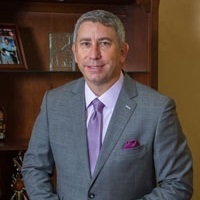 As a member of the Financial Planning Association, Joe’s expertise includes professional money management, investment planning, retirement planning, educational planning, estate planning, and business planning. He’s been featured in The Wall Street Journal, Barron’s, and Financial Planning magazine. On the personal level, Joe enjoys spending time with his wife, Gabrielle. Attending the theater and traveling with their children, Luca and Olivia, are favorite pastimes. Joe also coaches his son’s baseball team and plays competitive tennis. Being a former Division One collegiate tennis player has enabled Joe to meet great people all over the world.